INDIANAPOLIS — The NCAA has released the debut standings for the 2019 NCAA Wrestling Awards that will be awarded in March at the respective Division I, II and III Wrestling Championships. 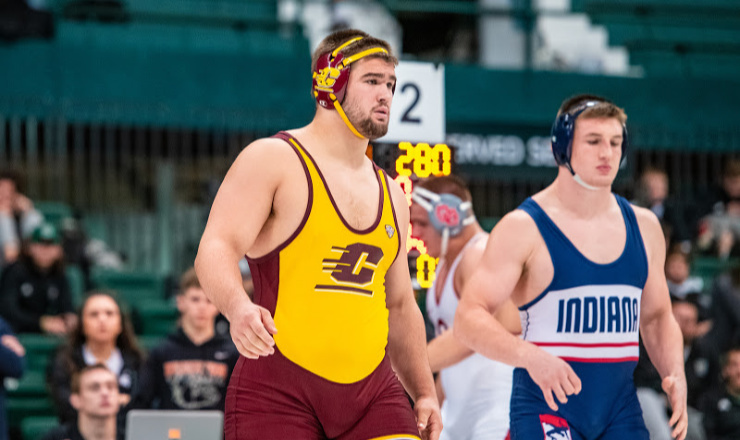 Division I is paced in falls by Central Michigan heavyweight Matt Stencel and George Mason 165-pounder Colston DiBlasi with 12 falls. Stencel has made much quicker work of his opponents to hold the aggregate time tiebreaker by 25 minutes over DiBlasi. Kent State’s Andrew McNally is the only other Division I wrestler in double digits with 10 falls at 184 pounds. A three-way tie with eight falls marks the Division II standings between Lake Erie’s Evan Loughman, Upper Iowa’s Justin Folley and Seton Hill’s Alan Diltz. Loughman wins the tiebreaker with an aggregate time of 17:01 at heavyweight to rank first ahead of 133-pounders Folley and Diltz. Heavyweights lead the way in all three divisions as SUNY Oneonta’s James Bethel is the sole leader in Division III with 12 falls ahead of an eight-way logjam of wrestlers with 11 falls. Heidelberg 184-pounder Dylan Roth leads that tight group to take second place overall with an aggregate time of 17:45. Last year’s winner for most tech falls is off to a strong start to repeat in Division I as Lock Haven’s Kyle Shoop has started this season with 10 tech falls. 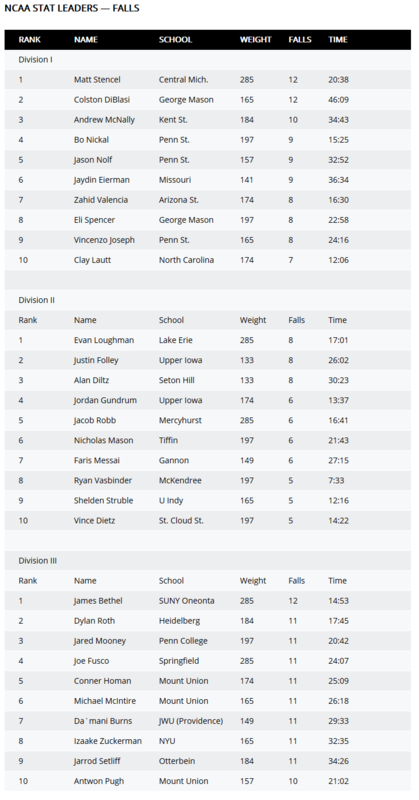 Oklahoma State 133-pounder Daton Fix is second with nine, while Minnesota’s 2017 NCAA finalist Ethan Lizak is third with eight. 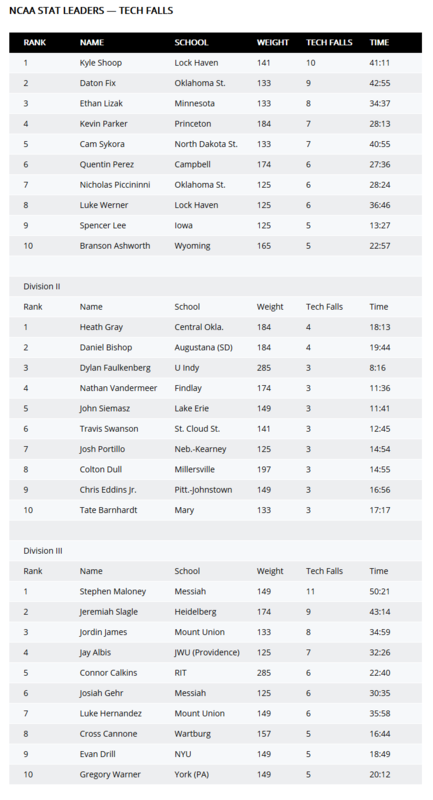 A pair of 184-pounders pace Division II with four tech falls as Central Oklahoma’s Heath Gray holds the tiebreaker in aggregate time, 18:13 to 19:44, over Daniel Bishop of Augustana (South Dakota). UIndy heavyweight Dylan Faulkenberg leads an eight-way tie of three tech falls compiling his in just over eight minutes. Messiah 149-pounder Stephen Maloney has earned 11 tech falls in Division III to lead by two over Heidelberg’s Jeremiah Slagle and three over Mount Union 133-pounder Jordin James.